The son of a Mexico City shopkeeper has built a staggering $59 billion fortune. Fortune's Stephanie Mehta tells the inside story of how he made it to the top. (Fortune Magazine) -- I remember there was a time when the value of his enterprises was very low," recalls Patrick, the youngest son of Carlos Slim Hel�. It was the early 1980s, and Mexico was in the depths of a massive financial crisis. Periodically the elder Slim would round up his three teenage sons for an economics lesson. Sitting them down in the living room of the family home, Slim would produce a single handwritten list. One line would show, for instance, how a Mexican insurance company was selling for far less than a similar American insurer. Another would show that compared with European candy or cigarette makers, Mexican manufacturers were drastically undervalued. "It was a very, very long time ago," says Patrick, "but I absolutely remember him teaching us at an early age." For Slim, a onetime math instructor, this was no mere academic exercise. Yes, he wanted to instill in his sons the same lesson his father - a Lebanese immigrant who started acquiring real estate in Mexico City during the Revolution of 1910 - taught him: Though Mexico will have its ups and downs, don't ever count the country out. But Slim wasn't just teaching, he was buying. He spent $55 million on an insurance company. He took a stake in retailer Sanborns. He invested in a hotel chain. 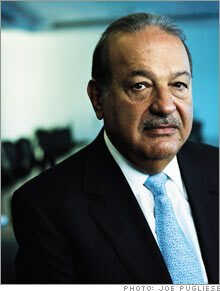 Wireless wealth pushed Carlos Slim Helu to the top of the rich list. Firstborn Carlos Jr. - the only bachelor among the brothers - cut his teeth on the family's retail chain, Sanborns. Marco Antonio is known as the moneyman. Patrick helps run America Movil, the Slim's most valuable division. Now those early investments are paying off big time. His three heirs - Carlos Jr., 40; Marco Antonio, 39; and Patrick, 38, run day-to-day operations at various Slim businesses and are increasingly making strategic decisions, while their father, who had heart surgery in 1997, pulls back. And Slim's investments in downtrodden Mexico? They laid the foundations of a sprawling, $150 billion business empire whose growth in recent months has turned Carlos Slim Hel� into the world's richest man. By our calculations, the 67-year-old Slim has amassed a $59 billion fortune, based on the value of his public holdings at the end of July. This number puts him just ahead of perennial No. 1, Microsoft founder Bill Gates, whose net worth is estimated to be at least $58 billion. But Gates is selling off his single greatest source of wealth, Microsoft stock, to fund his foundation, while Slim's fortune is growing at a stunning clip. His net worth jumped $12 billion this year alone. His family's holdings represent more than 5% of Mexico's 2006 gross domestic product, and Slim-controlled companies make up one-third of the $422 billion Mexican Bolsa, or stock exchange. Portly and often puffing a cigar, Slim could pass for a latter-day Latin American J.P. Morgan. But with his dominant stakes in everything from phones to finance, his business profile more closely resembles that of John D. Rockefeller, who likewise thrived in a loosely regulated environment. (For the record, though, even in current dollars Rockefeller's wealth pales in comparison to Slim's: At his death in 1937, Rockefeller was worth $20.3 billion, representing one fifty-second of 1937 U.S. GDP.) The average Mexican encounters a Slim-owned business when she visits an ATM, drives a car, stops for coffee, and especially when she picks up the phone - Slim's Tel�fonos de M�xico controls 92% of the country's phone lines, and his Am�rica M�vil wireless service has a 70% market share. George W. Grayson, a professor of government at the College of William & Mary, coined the term "Slimlandia" to describe how entrenched the Slim family's companies are in the daily life of Mexicans. It's not a reverential term. Many Mexicans hoped privatization, which began in the early 1990s, would create competition and drive prices down drastically. That hasn't happened. "Slim is one of a dozen fat cats in Mexico who impede that country's growth because they run monopolies or oligopolies," says Grayson. "The Mexican economy is highly inefficient, and it is losing its competitive standing vis-�-vis other countries because of people like Slim." Wooing the public isn't exactly a favorite activity for the Slims. "I think sometimes when you are successful in business," says Slim in heavily accented English, "you have others trying to turn public opinion against you because they are trying to compete with you." Slim, however, is beginning to court public opinion, pledging earlier this year to increase the size of his charitable foundations. Meanwhile, his sons are doing what the Slims do best: making more money. Anyone expecting to find monuments to the Slim financial empire in Mexico City - a gleaming TelMex tower jutting out of the skyline or an Am�rica M�vil stadium - would leave disappointed. In fact, Am�rica M�vil, Latin America's largest provider of wireless services, is housed in a converted tire factory. The juxtaposition of austerity and wealth can be quite odd, as evidenced by a recent visit to the headquarters of Inbursa, Slim's financial business. Just beyond the lobby is a makeshift art gallery that features a rotating selection of paintings on loan from the Museo Soumaya, a Slim-financed fine-arts museum named after his wife, who died in 1999. The room is a bit shabby. It is poorly lit and smells faintly of cigarettes; several large crates are propped against one of the walls. "We had several El Grecos here," Arturo Elias Ayub, Slim's son-in-law and spokesman, says matter-of-factly. There's also a folding table in the center of the room. "Mr. Slim sometimes likes to eat his lunch here," Elias adds. The famous Slim thrift - he used to show up for business meetings wearing a cheap calculator watch - extends across the entire company. Years ago he wrote "official principles" for Grupo Carso, his industrial conglomerate, which are distributed annually to all employees. One tenet translates into English as follows: "Maintain austerity in prosperous times (in times when the cow is fat with milk); it accelerates corporate development and avoids the need for drastic change in times of crisis." So, for example, TelMex's net debt equals Ebitda, or earnings before interest, taxes, depreciation, and amortization, a statistic that's unheard-of in its industry, where debt is typically three times cash flow. Am�rica M�vil actually has less debt than Ebitda. "They're rabid about costs," says New York-based Citi investment research analyst Patrick Grenham. "They borrow as little as possible and very carefully." Slim inherited his head for numbers - and his knack for bottom-fishing - from his father, Julian, who fled to Mexico in 1902 to avoid the Ottoman Empire's military draft. Julian Slim started a general store and bought commercial real estate in downtown Mexico City during the 1910 Revolution. He required his young son to record his childhood purchases in notebooks; Slim, a bit of a pack rat, keeps some of the ledgers on a shelf in his office. Though he taught math to make money in college, Slim graduated with a degree in engineering from the National Autonomous University of Mexico in the early 1960s. 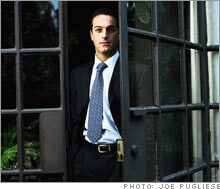 He then started a stock brokerage in Mexico City and began to acquire industrial companies he deemed bargains. He would reinvest the cash from those businesses or use it to acquire additional properties, and he named his holding company Grupo Carso ("Carso" is an amalgam of his first name and Soumaya's). Then came the crash of the Mexican economy in 1982. The country defaulted on foreign-debt payments, investors fled Mexico, and companies traded for centavos on the peso. Slim was able to scoop up assets on the cheap. All the while, he was schooling his heirs on his investments, occasionally even seeking their counsel to test their business savvy - such as the time he asked 12-year-old Patrick if he should acquire cigarette maker Cigatam (he did). "You make it fun," Slim says. "It is one thing to listen to a father lecture. It is better to learn from experience." The Mexican economy eventually recovered, and by the late 1980s Slim was one of the country's most successful businessmen. When the government put the state-owned telephone company, Tel�fonos de M�xico, up for sale, Slim jumped. He partnered with SBC (now AT&T (Charts, Fortune 500)) and France T�l�com to buy 20% of the company in late 1990 for about $2 billion - a fair price, based on other phone companies' market values at the time. 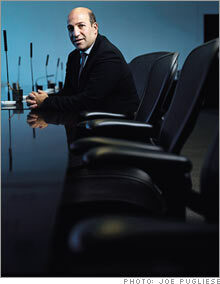 What rankled would-be competitors of TelMex (including U.S. long-distance companies such as MCI) were the terms of the privatization: Slim and company got what amounted to a seven-year guarantee of monopoly status at a time when phone companies around the world had the money - and will - to expand into new markets. Further clouding the deal was the fact that Slim was a huge contributor to Carlos Salinas de Gortari's PRI party. In his book about Mexican politics Bordering on Chaos, author Andr�s Oppenheimer describes a 1993 dinner party in which Salinas's people solicited 30 Mexican businessmen for contributions. According to Oppenheimer's account, Slim was willing to give but told the group he "wished the funds had been collected privately, rather than at a dinner, because publicity over the banquet could 'turn into a political scandal.'" Oppenheimer writes that the businessmen present pledged to contribute an average of $25 million apiece. A Slim rep declined to comment. "He made his billions because of an extremely close and advantageous relationship with the Salinas government," says professor Grayson of William & Mary. More recently Slim has been pragmatically investing in multiple parties, a common practice among Mexico's oligarchs.